Tuesday, 23 April, 6:30 p.m.
Wednesday, 24 April, 5:00 p.m.
To celebrate Earth Week, come join Presswork fellows and local printers to print an Earth Week-themed broadside that you can share or give to your friends and family. All are welcome to “fly” the common press—a wooden replica of an eighteenth-century printing press—in the South Gallery of the Albert and Shirley Small Special Collections Library. Food and drink will be served. Individuals of all ages, backgrounds, and abilities are welcome to participate and learn more about the history of printing. 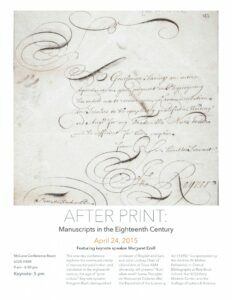 A public symposium jointly sponsored by Rare Book School, UVA Library, the McIntire Department of Art, and Virginia Humanities as part of Presswork, a project funded by The Jefferson Trust, an initiative of UVA’s Alumni Association. The history of the book is, in many ways, the history of technology—a study of the invention and development of special tools, machines, techniques, and crafts for manufacturing texts. Yet few people ever have the chance to try their own hand at using a printing press, or ever see how printing type is cast and made. Rare Book School is sponsoring a two-and-a-half-day seminar at the MIT Libraries in Cambridge, MA (map) on Wednesday-Friday, 12–14 December 2018. As UVA celebrates the change of season and the end of the fall semester, come join Presswork fellows and local printers to print a keepsake pamphlet that you can share or give to your friends and family. All are welcome to “fly” the common press and “steer” the rolling press—each wooden replicas of eighteenth-century printing presses—in the South Gallery of the Albert and Shirley Small Special Collections Library. Festive food and drink will be served. Individuals of all ages, backgrounds, and abilities are welcome to participate and learn more about the history of printing. All are welcome at Rare Book School’s fall open house, scheduled for Tuesday, 30 October 2018. Comic Books and Free Lunch! 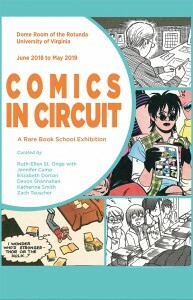 Please join exhibition curators Ruth-Ellen St. Onge and Devon Shannahan in the Rotunda Dome Room at 12:15 p.m. on Wednesday 26 September for a special tour of the RBS exhibition Comics in Circuit. This collaborative exhibition considers the materiality of comic books and graphic novels while tracing how they travel from creators to publishers to readers and beyond. Rare Book School is sponsoring a two-day seminar at the Winterthur Museum, Garden & Library and the University of Delaware on Monday and Tuesday 10–11 September 2018, preceded by a group dinner on Sunday, 9 September. During a time when “alternative facts” are regularly discussed and disputed in the mainstream media, archive-based evidence has become increasingly valued for its ability to document the histories and perspectives of diverse peoples, cultures, and movements. 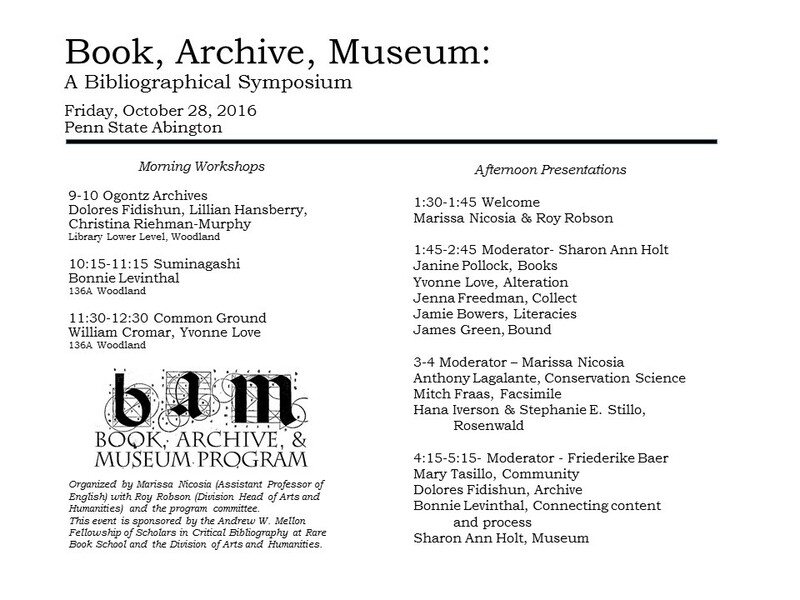 We invite you to join Rare Book School and the UVA Library for “Archives, Memory & Identity,” a public, one-day symposium that will bring together archivists, librarians, curators, digital humanists, academics, artists, and activists working on a range of cross-disciplinary, culturally sensitive projects that challenge traditional models for creating and stewarding visual and textual artifacts. All are welcome at Rare Book School’s winter open house, scheduled for Wednesday, 7 February 2018! Rare Book School is sponsoring a two-day seminar at the MIT Libraries (14N-132) in Cambridge, MA (map) on Monday and Tuesday, 11–12 December 2017 (just prior to the IEEE workshop Computational Archival Science: digital records in the age of big data). All are welcome at Rare Book School’s fall open house, scheduled for Wednesday, 1 November 2017. Please join us as we celebrate 25 years of RBS at UVA! Considering two early-twentieth century instances of print culture on the northwest coast, this lecture explores the ways the printed page can serve as an affordance for cycles of public and political appeal and remembrance. Juxtaposing the anti-colonial uses of a missionary printing press by Nisga’a printers with the marginalia in an Archbishop’s library of texts on psychic research, I show the changing meanings of the revolutionary spirit in a land of contested sovereignties. Bibliography Among the Disciplines, a four-day international conference to be held in Philadelphia from 12 to 15 October 2017, will bring together scholarly professionals who are poised to address current problems pertaining to the study of textual artifacts that cross scholarly, pedagogical, professional, and curatorial domains. The conference will explore theories and methods common to the object-oriented disciplines, such as anthropology and archaeology, but new to bibliography. The Bibliography Among the Disciplines program, supported by Rare Book School and the Andrew W. Mellon Foundation, aims to promote focused cross-disciplinary exchange and future scholarly collaborations. This workshop focuses on standards and best practices for descriptive terminology and cataloguing. Bringing together specialists of Japanese art with extensive experience in researching prints and books, we will consider how we describe, catalogue, and present these materials in American museums. (5:00 p.m., 308A Doe Library, UC Berkeley). (10:00 a.m.–12 p.m. and 1:30 p.m.–2:30 p.m., The Bancroft Library). This symposium will examine the different kinds of value that pre-1800 textual fragments possess, accrue and/or produce in and through their fragmentary nature. It will also examine the intellectual value with which we imbue the fragment, when we argue that it is or is not representative of a historical record, when we debate whether it testifies to extreme scarcity or extreme abundance, when we argue whether it does, fails to, or should perform the work of memorializing a “lost” moment. Does compression have a history? Please join the University of Denver Department of Religious Studies on Friday, 28 April for our Buddhist Book Cultures Symposium from 1:30 to 5:00 p.m. in Sturm 286. Why did some people produce idiosyncratic texts that defied the norms of reading and writing of their period? How did these practices change social actors’ relationship to political or religious authorities? What information can we obtain from the nontextual elements of documents, and in what ways does this kind of information help us better understand the meanings of texts? From the days of the early reformers through the twenty-first century, Protestants have made voracious use of printed books and other media to spread a religion of the Word. For its vaunted emphasis on texts, Protestantism remains associated with words, thought, and private reading, as opposed to things, practices, and communal devotion. However, as scholars across the disciplines have demonstrated, texts are never only containers for words. Whether handwritten, printed, or typed on a screen, words and their meanings are entwined with material forms and embodied practices at every stage of their production, circulation, and reception. The Duke Divinity School and the Andrew W. Mellon Fellowship of Scholars in Critical Bibliography at Rare Book School sponsor a public lecture, “The Medieval Bible in the Polarized World of American Religion,” by Frans van Liere, Professor of History and Director of the Medieval Studies Program at Calvin College. A symposium will follow on Friday, 7 April. Campus lecture by Svanhildur Óskarsdóttir (Research Associate Professor, Árni Magnússon Institute for Icelandic Studies, University of Iceland), an expert on the study of medieval manuscripts from the University of Iceland, who will speak on “The Never-ending Popularity of Njáls Saga: The Manuscript Evidence” as part of the University of Maine Humanities Center’s 2016–17 symposium Saga and Story: An Interdisciplinary Exploration from the Vikings to Our Time. This conference proposes a new concept—“(dis)entanglement”—in order to provide alternative narratives of the early modern world, 1300–1800. Recent scholarship has emphasized the integrative nature of economic, material, and religious developments. In contrast, we will examine what the “global” could mean in intellectual and cultural interactions in terms of both integration and disintegration across multiple continents and oceans. Our conference participants will explore how the notion of “(dis)entanglement” allows us to evoke a polycentric early modern world that is simultaneously connecting and disconnecting. Recent scholarship in bibliography and the history of the book has attended to the ways in which bibliographic media resist, defy, and elude uniformity, even under the greatest technological pressures to conform. Whether through variables in the production process or through the vagaries of transmission and consumption, each manuscript or printed book carries with it the traces of a unique history. In association with the exhibition “Paper: A Material of Empire and Revolution in South Asia” on view in Dartmouth’s Baker-Berry Library through January 2017, we have invited scholars who touch on how paper as a material intertwines with the information that it carries. If you’ll be in Boston for the Boston International Antiquarian Book Fair (28–30 October), please be sure to stop by the Rare Book School table on Cultural Row. We’ll be at Booth 628 (floor plan), with printed copies of our spring/summer 2017 schedule, a slideshow of images from 2016 RBS classes, and more. Rare Book School and the Antiquarian Booksellers’ Association of America (ABAA) are co-sponsoring a one-day seminar series at the North Bennet Street School in Boston, MA (map) on Thursday, 27 October 2016 (just prior to the Boston International Antiquarian Book Fair). These seminars have been designed to be of interest to book collectors and booksellers, but signup is open to anyone with an interest in the topics covered. The cost to attend the seminar series is $500. Professor Carissa Harris of Temple University presents “Obscenity, Censorship, and Creativity in Fifteenth-Century Manuscripts” on Monday, 17 October at noon. See the event website for additional details. This talk, organized by the Oregon Rare Books Initiative, was given by Cynthia Herrup, Professor Emerita of History and John R. Hubbard Chair in British History Emerita at USC Dornsife. A conference considering the relation of the material text to the formation and function of states and state-like structures. An investigation of the methods and effects of state and institutional manipulation of textual materialities to create, control, or shape responses from the oral ancient to contemporary digital. Rare Book School Director Michael F. Suarez, S.J. will deliver the keynote address. All are welcome at Rare Book School’s fall open house, scheduled for Thursday, 15 September 2016 as part of the Human/Ties program at UVA to celebrate the 50th anniversary of the National Endowment for the Humanities. Our media landscape is changing radically. New technologies offer new ways of reading and new modes of presenting texts—but how completely can we really break with old paradigms? Do the design principles of the printed book have a place in our digital future? To find an answer, this conference compares our ongoing technological revolution with an earlier one: the invention of the printed book itself in Renaissance Europe. Lectures, workshops, and discussion by historians and practitioners of printing, web design, and typography will enable the audience to apply lessons from the Renaissance to the design challenges of the present. Duke Divinity School Professor Jennie Grillo has organized a symposium featuring David Stern of Harvard University and Dagmar Riedel of Columbia University as well as a number of local scholars presenting their research on histories of religious books in various traditions. Stern is the Harry Starr Professor of Classical and Modern Jewish and Hebrew Literature and professor of comparative literature at Harvard, and Riedel is an associate research scholar at Columbia. This one-day symposium will bring together scholars from across the humanities to discuss the role of the material text in their research and scholarly practice. The bibliographic scholar D.F. McKenzie famously asserted that the form of a text inevitably shapes its meaning; from contemporary internet cultures to medieval manuscripts, how do we account for this in the specific archives, media, and disciplinary contexts in which we conduct our work? The keynote address, “Why Books Matter,” will be delivered by Elaine Treharne, Roberta Bowman Denning Professor of Humanities and Professor of English at Stanford University. Thursday, 31 March at 5 p.m., Neff Hall, Room 101 (Indiana University-Purdue University Fort Wayne). Additional panel sessions will be held on Wednesday, 30 March and Thursday, 31 March. See the event website for full details. All events are free and open to the public. 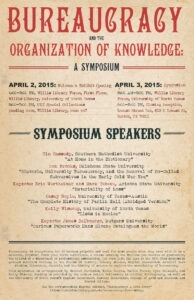 This symposium will bring three scholars to the Berea College campus. Each of their work intersects with history of the book and humanistic inquiry in different ways. The symposium has been supported by the Andrew W. Mellon Fellowship of Scholars in Critical Bibliography at Rare Book School, the Art and Art History Program, the English Program, Hutchins Library, and the Dean’s Office. The symposium is structured around presentations by visiting scholars in classes and presentations by students in ARH 286 on books from the Curio Collection. The schedule is below. Rare Book School and the Antiquarian Booksellers’ Association of America (ABAA) are co-sponsoring a joint one-day seminar series at the North Bennet Street School in Boston, MA on Wednesday, 11 November 2015 (just prior to the Boston International Antiquarian Book Fair). These seminars have been designed to be of interest to book collectors and booksellers, but signup is open to anyone with an interest in the topics covered. This conference will bring together a group of advanced graduate students to share their doctoral research and the diverse ways in which they take materiality into account in their studies of Latin America and the Iberian Peninsula across disciplines. In the preface to Micrographia (1665), one of the first visual studies of the microscopic world, the experimental philosopher Robert Hooke argued that knowledge of nature was rooted in human vision, especially as augmented by tools like the recently-invented microscope, and human craft, which built the microscope and made images of the new worlds that it revealed. Hooke suggested that without such instruments, humans were ill-equipped to apprehend the true nature of reality, hidden just beyond the edge of sight. The microscope challenged the primacy of human vision—augmenting it, but also threatening to override it. Presented by: The Andrew W. Mellon Fellowship of Scholars in Critical Bibliography at Rare Book School, the Simon H. Rifkind Center for the Humanities and Arts at CCNY, the Division of Humanities and Arts of CCNY, and the CCNY English Department. This one-day symposium will present research on the impact of books and print on intellectual contact (broadly construed) within Europe as well as between European and non-European cultures. Presented by: The Andrew W. Mellon Fellowship in Critical Bibliography at Rare Book School; the Dean of Faculty, the Department of Asian Languages and Civilizations (the Tagliabue and Hall Funds), the Department of Art and the History of Art, and the Program in European Studies at Amherst College; and the Book Studies Concentration at Smith College. (Gero Dolezalek will teach a legal paleography workshop on 28 August 2015). Presented by: The Andrew W. Mellon Fellowship of Scholars in Critical Bibliography at Rare Book School, Brill Academic Publishing, the British Society for the History of Science, the University of Iowa, the University of Lincoln, the University of Oregon, and the Royal Society. This conference will bring together junior and senior scholars to explore the continued vitality of manuscript publication and circulation in the eighteenth century. Scholars now often take for granted that the eighteenth century constituted an established “print culture,” whether that culture was inherent in the technology or forged by its users. By the age of Addison and Pope, this narrative contends, the spread of print and lapse of licensing had rendered superfluous a manuscript world of scurrilous libels, courtly poetry, and weekly newsletters. Humanities research requires the study of books, but we often confront the limits of this category. 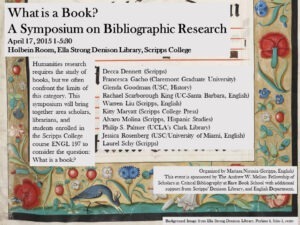 This symposium will bring together area scholars, librarians, and students enrolled in the Scripps College course ENGL 197 to consider the question: What is a book? Organized by RBS-Mellon Fellow Marissa Nicosia (Scripps College, English) and featuring (among others) RBS-Mellon Fellows Glenda Goodman and Rachael Scarborough King. See the event website for additional details. From current historical work on material and visual cultures, to anthropological research on the social life of things and new approaches to seeing and reading in historical scholarship, the study of the physical evidence of culture has become a pressing issue. This interdisciplinary symposium will bring together conservators, curators, and scholars of art history, literary studies, book history and bibliography to reflect on the historical relation between materials, objects, and practices and different forms of visual and textual production in nineteenth-century America. Bureaucracy is everywhere, but it becomes palpable and real for most people when they meet with it in a material, physical form: your birth certificate, a course catalog, the diploma you receive at graduation, the bylaws of a department or professional association, IRS Form 1040, the line at the DMV. This symposium gathers scholars working in the fields of history, library science, digital humanities, material text studies, literature, rhetoric, and the history of science to explore the materiality of bureaucracy. 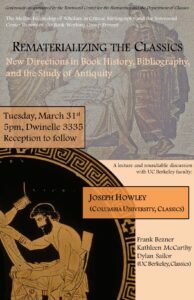 A lecture by RBS-Mellon Fellow Joseph Howley, “Rematerializing the Book in the Roman Empire,” followed by a roundtable discussion with Berkeley faculty on the role of material studies in the field of Classics more generally, and future of materiality and book history in the study of antiquity and after. Join Rare Book School, the UVA English Department’s Renaissance Area Group, and the Folger Shakespeare Library for a Transcribathon. Learn from Folger Curator of Manuscripts Heather Wolfe about paleography and transcription of early modern English documents, and have a go at it yourself using special transcription software developed at the Folger. A two-day symposium focusing on the question of popular literacy during the High Middle Ages, featuring a public lecture and Q&A by Professor Carol Symes (University of Illinois), followed by a workshop for students and faculty. Rare Book School sponsors and co-sponsors a range of programming at various times throughout the year, including activities at book fairs, symposia at UVA and other locations, and more. These include events organized by members of the Andrew W. Mellon Society of Fellows in Critical Bibliography at their home institutions.